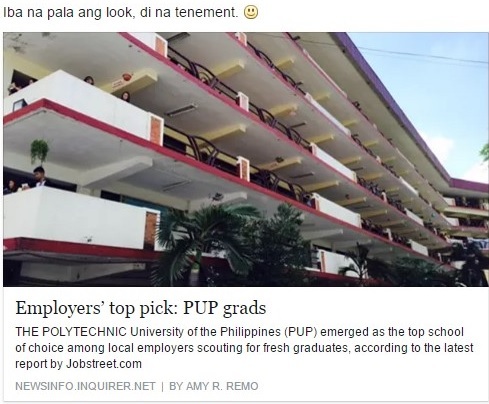 PUP: From Military Tenement to Employers’ Top Choice! Said news has also circulated in every top newspaper in the Philippines and has been posted and re-posted several times in the social media. But, did you know that PUP was originally built as a military tenement? Yup, that is why such structure. The happy thing is that I’m an alumnus of the Polytechnic University of the Philippines and this news makes me very proud of my alma mater, its leaders (old and new) and, of course, its students (old and new also). The employer preference per se is not what I’m happy and proud of because I’m still very much against school discrimination, having experienced it first-hand. What I’m happy and proud about are the employers’ feedbacks on PUP grads. They are very true and heart-warming. Let me re-enumerate and expound in my own words why PUP graduates got the edge (with a disclaimer!). 1.) Just like what most employers say, PUP graduates possess a lasting power in a company. Because we were raised to be patient and endure even the most difficult situation. During my last year at the Uni, the comfort rooms were all under construction. Imagine, taking exams, attending classes for long hours and not being able to use the comfort rooms. Tiis tiis lang kami. I know it’s not right, I know it’s below the standards of humanity but what can one do, it’s all we could afford. Kaya naman, many of us are not maselan when it comes to the work environment/conditions because we’ve been to worse situations. Warning lang din, we may be very patient and accepting but we never settle for less than what we can still achieve! Lucky students of today, school leaders have improved the campus over time. Just look at the pictures, it no longer looks like a tenement! 2.) PUP graduates do not have the attitude of self-entitlement. True naman! The professors will never allow you! Ha! Actually, before these surveys, na lately na lang din naman, we feel we are less preferred by employers. Kasi top choices nila ang UP, UST, Ateneo, Mapua and La Salle. So, we knew we have to work harder during employment tests and interviews, to make them take a second look at us, to convince them that we only need to be given a chance to unleash our potentials. When I was still in the Uni, my professors would always remind and encourage us to try our best to impress the interviewers when applying for a job, not with attitude or experience but with articulation and willingness to learn and be trained. They would always tell us that it’s only difficult for us to get in but once we’re in, we’ll be absorbed permanently in no time (meaning, madali kami ma-reregular). 3.) We have good professors. Maybe not all, but we have great faculty, at least in Accounting. These professors will not spoil you nor beg you to take exams (bato bato sa langit!). They will treat you as an adult, responsible for your own actions. In Accountancy, there are what we call 2.0 policy, evaluation exams and qualifying exams. 4.) PUP graduates are eager to learn and won’t easily give up. Again, it’s because we’ve been trained the hard way. If we give up so easily, then we won’t be able to graduate and get a better shot at life. We fear that we’re missing a lot compared to other students from expensive universities who can pay for training, seminars and student exchange opportunities and, that fear fires our eagerness to learn more and be trained. 5.) We’re not choosy too when it comes to employers. Maybe because we can relate to these smaller companies, we also want to be given the chance to prove ourselves. Honestly, I also think that graduates from other universities do not really look for long-time employment. Maybe they just want a brief experience before they focus on their family businesses. They do not need employment as much as we do. We, the PUP grads, well, most of us, on the other hand, have to find work and earn money ASAP due to personal circumstances. We need to recover those tuition fees. Once, I’ve come across a manager who thinks lowly of PUP graduates, as if the school has some contagious disease or some real bad reputation, know what, I myself wrapped up the interview (kasi naman I’m no longer a newbie at that time, I have already banked on career experience). Why bother wasting my time for someone who discriminates based on the school you were from, diba? I was looking for a better opportunity, a place to hone my craft and for a mentor and surely it was not the place. I feel bad for her. She does not know what she’s missing. Anyway, I hope she reads the news lately. I’m sure she does. Manager C, this is for you! Amid this recognition, I just hope that employers won’t take advantage of PUP graduates. Do not underpay them nor overwork them just because you know we’re matiisin and hardworking. Don’t forget that it’s the same PUP students who know how to voice their opinions and fight for their rights. Make no mistake, we may seem submissive and all but we’re smart enough to spot abuse, disrespect and inequality. After my term, I honestly thought that PUP would be going down the stream. It was not as good as it was in my first year. It was in a pretty bad shape, physically and academically when I left. Hell, I was wrong! Sorry, dear alma mater for being so quick to judge and for not believing in you! Thank you and congratulations to all the leaders and students who worked hard to redeem its place in the industry, a place she truly deserves. May the next generation does it even better.